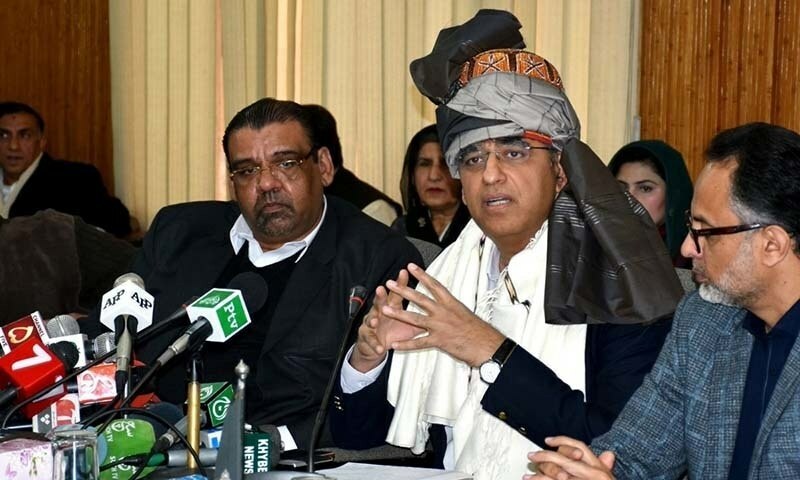 Finance Minister Asad Umar on Monday said that differences between Pakistan and the IMF had decreased following Prime Minister Imran Khan's meeting with International Monetary Fund (IMF) Chairperson Christine Lagarde on the sidelines of the World Government Summit yesterday. "IMF has changed its position," Umar said in an address at the Chamber of Commerce and Industry in Peshawar. "It seems like we have come closer to reaching an agreement with the IMF." The prime minister had described his meeting with Lagarde as a "convergence of views", while the latter assured him that the "IMF stands ready to support Pakistan". 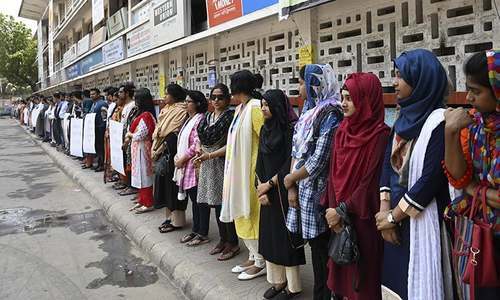 The finance minister added that Pakistan's economic situation would only improve if the local business community and policymakers worked hard and made the right decisions. Earlier today, senior PPP leader Sherry Rehman urged the government to address the reservations of the opposition over the IMF bailout package, and to disclose the terms of the agreement in Parliament. "Why are the terms of the agreement being kept secret?" she asked. "How much of a loan will the government be taking from the IMF and what are the terms?" "This agreement means the budget for the coming year will be coming from IMF headquarters," Rehman alleged. "Are funds for the provinces being decreased at the IMF's behest?" Rehman asked. "Details of the agreement should be presented in Parliament," the PPP leader asserted. "The government should maintain transparency and remove our reservations before the agreement is reached." Umar, while addressing the Peshawar Chamber, also stressed the need to increase regional trade and improve relations with neighbouring countries in order to boost the economy. The finance minister said that while it is a good thing that Islamabad's relationship with Beijing is progressing and work on the China-Pakistan Economic Corridor is underway, there is "a need to improve relations and boost trade with [countries in] both the west and east of the region we live in". He insisted that Pakistan needed to "increase trade with Iran and Afghanistan with complete focus". He also noted that officials from Western countries often say that regional trade is important and that Pakistan should improve trade relations with India. "They are not wrong [...] but I ask them why doesn't this principle apply to Iran?" "As far as the east is concerned, it seems that [there can be no progress] until elections are over in India. Half of their election campaigns are based on anti-Pakistan rhetoric, so right now they are busy with that. Once the elections are over, we hope that their behaviour will be better," he said. The finance minister also commented on the Afghan peace process and said that "Pakistan should play whatever role it can" in ensuring peace in the neighbouring country. "It is clear to the people living in Peshawar and the rest of KP [that there should be peace in Afghanistan]. It should be clear to everyone that there can be no peace in Pakistan unless there is peace in Afghanistan." He acknowledged that trade had slowed down due to the closure of Torkham border and pointed out that the prime minister had already announced that the crossing should remain open 24 hours. However, he said, due to the slackness of government departments, progress was slow. 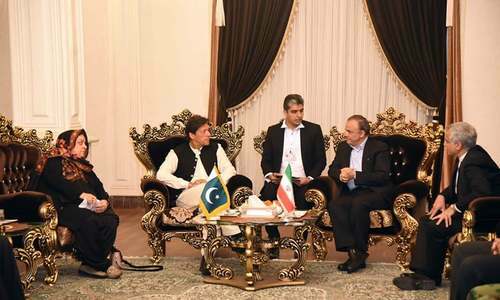 He also revealed that during Prime Minister Imran Khan's visit to Turkey earlier this year, Islamabad and Istanbul had agreed on working on a strategic economic framework. Pakistan will hand over the first draft of the framework to Turkey in February, he said. The Turkish delegation, that is working on the framework, is being led by the Turkish vice president, while the Pakistani side is being led by the finance minister himself. "I said to the Turkish vice president that this [framework] should not just be limited to us. Our vision for the next 10, 20 years should be for Iran to become a part of this [economic framework] as well," he said. "Iran, Pakistan and Turkey should obviously be a part of it. [Through this framework] Pakistan should become a gateway for Turkey so they can trade with India and China. And Turkey should become a gateway for Pakistan so we can trade with Europe and Central Asia states." The finance minister also emphasised on the importance of developing the tourism industry in Pakistan. He said that mountainous areas could not be industrialised anywhere in the world, but they could be developed to boost tourism. Good.some one finally stressing the need of trade rather than kasmir. This is the man who sent Imran to the IMF! Let that be on record. But your foreign minister is more interested in resolving Kashmir issue. Good, at least do this. Dont blame India for your downfall, in trade, commerce, business, just learn from Bangladesh, how they are rising, internationally, with increase in exports. Erroneous statements, wont even let Indian cargo plane from Spice jet, using Pakistan airspace, to Afghanistan. If you are realy serious then sign more FTA with China and open your agriculture sector for Chinese investors. It has huge potential. Chinese farm products are cheaper than Pakistan's costlier products. Pakistan has no good relationships with neighbours except one. Remove tax on cheap electronic products from China. Typical PTI hypocrisy, when NS wished to have trade with India he was labeled as traitor by PTI wala. Now PTI masters have given them go ahead to do trade with India and Afghanistan. 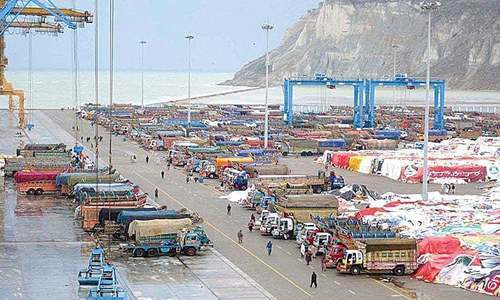 Pakistan has constantly refused Afghanistan, that it will not let, Indian trucks loaded with goods, go through Pakistan road, space, and now making distorted statements, that it should improve trade relation with eastern and western neighbors. You cant even give Most Favored Nation (MFN)status to India. Very good! Now please tell this to IK & COAS. Chinese companies are doing great business in India and Indians are also working in Chinese company in India. VIVO, OPPO, XIAOMI and many others are doing very good business in India. So why not Pakistan? Everybody is not sensible like you. 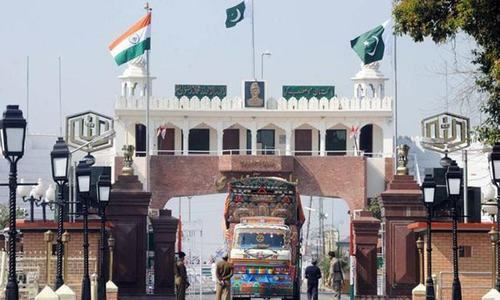 There are hardly any silver linings amid the grey clouds of competition, it is the fact that normalizing relations between India and Pakistan, would be a boon for business in both countries, but doubt its going to happen. "They are not wrong [...] but I ask them why doesn't this principle apply to Iran?" What works for Iran , may not work for you. Their economy is larger than yours. Let K issue be resolved first.. why bother about trade? @Jugnoosa, 100% agree with you. Sell ur products to china. @Jugnoosa, Your Pakistani traders import Indian products from Dubai, costs them twice more. We don't want anything to do with India. @Shivam, good. soon there wont be any need for indian trade with the taliban led afghanistan. @Jugnoosa, Good ,India is not in hurry to do the trade with Pakistan. Also India is not loosing any thing by not having trade with Pakistan. Understand this that it only hurts Pakistan not trading with India. Indian elections are based on development, anti corruption,caste politics, farmers and employment.Nobody Care's what our neighbors are doing. @Yuong, tax and duty are required to be paid, period. @Pranab, no need for indian trucks to go to afghanistan shortly, problem solved. 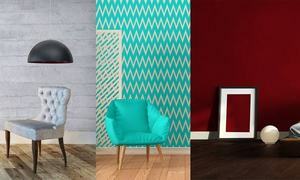 @Sarita, these companies are selling their goods in Pakistan already. India cant make a world class smartphone? Trade with neighbours. Sensible statement..
@Shivam, don't take it too seriously. It is the statement, thanks to IMF. There is no reason to believe that overnight they become so sensible. How can any nation worth its salt ignore another of 1.2 billion potential consumers for trade? There is China but they always ensure a surplus in their favour. Turkey has a relatively small population and is more inclined to its western neighbours. Iran is good for oil. Then who is the trade and collaboration arrow pointing to? 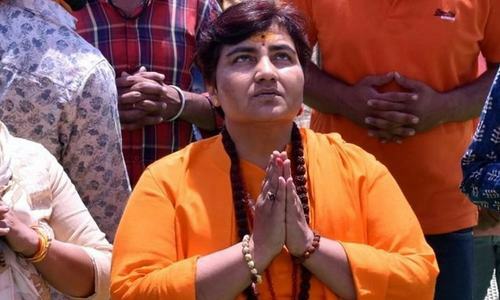 Personally, I don't see any anti Pakistan rhetoric by Indian politicians winning them massive votes. Their political leaderships are more engrossed in belittling one another. India's behaviour towards Pakistan will never improve. HAHA, finally budged under the pressure. This is what we have been saying since long. Good that you made the right decision. Do trade with your neighbors - put Kashmir and other issues on hold; eradicate terrorism. Grow the economy the hard way without aid or grants, improve access to broad-minded modern education, improve health care, conserve natural resources- especially water, help alleviate poverty. If you do all this, see how the neighbors start envying you and work with you to address all outstanding issues. Bangladesh is a good example of how to deal with India, and grow their country. So finally you realized it! But given the situation in Pakistan, we will not be surprised if you are sacked for making that statement. @bhaRAT, Good ! stay home , stay well. @bhaRAT, Our Hindi films are doing great business in Pakistan and does better than yours.Can you stop? Pakistan requires India much more than India requires Pakistan.Pakistan's survival now depends on trade with india.High time that Pakistan now forget the K word. I don't think Pakistan should ever talk to India or vice versa. Enough is enough!!! after 72 years if things have not become good why it would get better in future. What is the change in thought process of Pakistan. I say nothing and so might be the case with India. If nothing is going to change then nothing will change. @Only, Whatever the reason but this is fact. It is clear that Pak needs India to boost it's fragile economy and not vice versa. It is unlikely that India will soften it's stance anytime soon as precondition laid down for resuming any kind of talks with Pak is still not met by Pak. And we all know what that precondition is. This is the first Pakistani Govt that's thinking like leadership from countries where businesses are thriving whether it be China, Japan or EU. They're talking about frameworks between countries so Pakistani businesses can export more. InshaALLAH PTI would change Pakistan's economic lookout in years to come. @fairplay, Every country has some sectors they dominate like Chinese for cheap products& electronics ,Taiwan for electronics, German for auto ,US for Innovation (Apple,Tesla).India is largest generic drug producer (pharmaceutical), automobiles, diamond cutting (95% diamonds in world are cut in one city in Gujarat called Surat) , IT exports (3rd most valuable IT service company is TCS after IBM(USA) & Accenture (Ireland)), cement,cereals, medical tourism.Now what does Pakistan famous for? Pakistan should increase her production and quality for exports and local market. Nothing will change after elections in India irrespective of who wins the elections. So please dont hold your breath. @Shivam, The world knows BJP black face and result is very clear from election 2019. @Sameer, so what. If necessary so be it. Past government's left us in financial mess. @fairplay, Those smatphones are manufactured in India under MAKE IN INDIA and sold domestically thereby bringing FDI and genrating jobs. Check out oppo vivo plants. Is this the same case with Pakistan? What does Pakistan have to offer? Indian economy is doing quite good without trade with Pakistan and with Chabahar, India has gained access to Afghanistan & beyond. Pakistan should start the trade relations with India and offer it free passage to Afghanistan and central Asian countries and beyond. Pakistan`s gain will be huge. Only trade can save Pakistan, not loans. Indian politics in election campaign does not..Repeat does not involve pakistan or any other country. All are internal matters of india only. Please open your eyes and ears. Trade or no trade, India is moving up. This is just his statement. The establishment would never allow this. Although it is true that to improve its economy, image and people’s welfare Pakistan must trade with India, but this is true since 1947. Nothing new. Nothing has been done till now and nothing eventually will be. At the end people’s welfare is certainly not more important than Kashmir. Is it? "Differences have decreased", This means Pakistan is agreeing to all the conditions set by IMF one by one. Pakistan needs a bailout, and IMF will not take risk so it's simple logic that Pakistan will have to agree to all the terms set by IMF. Yes. Now it is only 14000 kms. @Jugnoosa, agree with you. why trade with India when we can get free money from Qatar, UAE, China, Malaysia and Saudi. IMF opposers get educated. Without IMF program Pakistan cannot correct its budget and it's international rating so that other international agencies like World Bank and Asian Bank come to rescue further Pakistan's economy. @fairplay, you don't understand business, brother Chinese have done investment in India worth billions with Indians as MD's and CEO's and all the manpower is indian, hope you may understand difference between investment and loans. Nobody is talking about Pakistan. And I am sure nobody will even after election. And these statements from FM will not be forgotten in 3-4 months. These are closing the doors of talks forever. @fairplay, . Friend we make most of the Apps which run your smartphones. Microsoft and Google are some of the companies who have recognized it and hundreds have opened offices in India too. Any takers for Pakistan? Political concessions vs loans, the old story. U-turn on there claims of transparency. That body language says it all. If energy prices are increased further , exports will collapse, already Pak gas prices are twice that of Bangladesh and Vietnam. Investing PSDB in mega dams is another long term need. Dr Ishrat hussain or a growth eccentric economist should be heading finance rather than a basic accountant failing consistently. That's your opinion not that of your finance minister. @bhaRAT "We don't want anything to do with India"
And yet your Finance Minister is saying that Pakistan wants to do trade with India and your PCB Chairman said yesterday that Pakistan needs to play cricket with India. So I would take your word over yours. @M.Emad, the Finance Minister is giving "Alternative Facts". A message for PPP leader Sherry Rehman, Pakistan has to pay back $5 billions in principal and interest by Jun-2019, which PPP and PMLN borrowed. There are no dollars left in the treasury. You tell me how to payback with out borrowing from IMF. Going to the IMF is inevitable and it will happen. It has been interesting to hear the opposition's point of view on this. Those who do not know the ABC of economics have suddenly become experts. I read somewhere today that Maryam Aurangzeb (a prize winner in Economics from the PMLN institute of Ishaq Dar Economics!) said that going to the IMF would result in sky high inflation. This is the same lady who a few months ago said that Pakistan should go to the IMF and stop begging from the Saudis and Emiratis. I think she should concentrate on other issues as Economics is not her strong point. Finance minister is clueless about economy and finance. US $ will be trading close to Rs 160-170 before then end of this year. @fairplay, @Yuong, tax and duty are required to be paid, period. Similarly loans are also required to be paid otherwise you may lose the collaterals. Please leave India alone. You deal with your matter. If you follow the Indian press and news channels you will find that not even 1% of the election rhetoric is anti Pakistan. They are too busy finding faults with one another - which is what normal elections are supposed to be in a normal democratic country! what happened. Mr. Omar has been saying IMF not needed and now suddenly IMF is being approached. is the cooperation on Afghanistan driving this?what is behind the change of heart? citizens deserve to know. @Jugnoosa, what is your product by the way? Look who is he kidding? Perhaps himself...prior to reaching the deal he has pretty much met all imf conditions...look at the value of dollar...inflation...IK got his PM chair...this dude got to play finance minister..and what people got?...The IMF deal....Priceless! @Shivam, what should we learn from Bangladesh? how to live under pressure just like Kashmiries are living? Funny that Miss Shery Rehman talking about transparency? PTI is the first government sincerely and honestly attempting to bring Pakistan out of the woods. I think people of Pakistan should blindly support IK and not pay attention to party of goons. This is not cricket match. Only ground reality will work . Rating is going down, how can one lend money or do business in such condition . Investor will think twice . Strange that when PMLN promoted the same agenda they are labeled as 'traitors' by the same people now making these statements. Finally imf bowed down infront of PMIK. @Sweets, - why you are asking, what Pakistan is famous for? Whole world knows about it and therefore increasing security measures in their countries. Ms. Rahman might take a note that her party's demonstration of concern for Pakistan is taken as disingenuous at best, being critical of PTI for similar decisions they handled in worse ways more than once. Had they demonstrated a similar concern for the share of deficit as they do for funds, they could be taken more seriously. As things stand, Imran Khan has shown himself to be honest, and believe me there would unlikely be a happier man, if something remotely similar could be said about her party's leadership. @Pro Democracy , NS did increase trade with India. Though only personal, and not of the country. After all, that was all his politics about. Just like CPEC was a gift to his person. @Sweets, What Pakistan is famous for, you ask? Where have you been my friend all these years? Pakistan is number one in the world in IT of a different kind. IMF wants the rupee dollar parity to be 150 to one and utility prices to be increased by at least 50% to increase revenue. Only then the IMF loan package will be signed. In other words you have acceped IMF terms. Why PM IK sidelined you from IMF negotiations? So finally it has dawned on the policy makers that IMF is the right destination, already tested by the country to bail out it once again from the serious economic crisis within which it is currently entangled. To request for help from friendly countries is good but it can be quite limited, a sort of “Pocket money” for riff raff expenses. IMF is meant for such type of situations in which Pakistan currently finds itself in. The country needs, as per reports, about $ 1200 billion to be somewhat stable. Besides other functions IMF allows Govts. to prioritize economic growth and to provide short term capital to aid the BOP (balance of payment). It also facilitates the expansion and balanced growth of trade in international market. Until and unless houses and buildings are not taxed appropriately (at least 1% of the value of the structure), our norm of going to the IMF and getting into more and more debt will not end. Unfortunately, PTI is doing nothing in this regard. Why did they not reveal the terms in their tenure.PTI has been too generous , they should not have allowed coverage of the opposition on TV. yes the differences has decreased as we have accepted their terms. @bhaRAT, Great attitude even when you are free falling. It seems that IMF has agreed to all the terms and conditions set by Pakistan. As for Indian elections please note that neither the ruling nor the opposition parties ever mention about you. So your notion is completely wrong here as well. IMF is a bank, that never wish to loose its customers. Pak is an old customer, and Pak Govt and political parties are minions of IMF always act as tools for financial crunches, ultimately creating vacuum for IMF to step in. Getting loan is no achievement. Get ridding of deficits will be achievement.